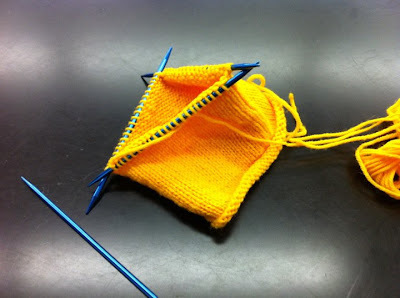 Well, for those of you who follow me on Facebook you know that I am learning to knit. 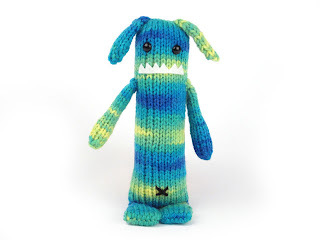 I found an etsy store, Danger Crafts, full of these very cute knitted monsters by Rebecca Danger and immediately thought of my grandmother. She was an immensely creative person who was constantly creating. She knitted, crocheted, sewed, just about anything you could do with your hands. One of my favorite childhood memories is of going over to my grandparent's house and where my grandfather would bar-b-que and my grandmother would turn my drawings into 3D stuffed toys. Since my grandma had everything she really needed and didn't really want anything for Christmas we would always get her lots of yarn which she would knit into afghans, wash clothes, stocking caps and whatever struck her fancy. I knew that she would have gotten a kick out of knitting Rebecca Danger's monsters. Since my grandmother had passed a last October I decided that as a tribute to her I would learn how to knit myself and make one of the monsters. I purchased a kit of one of the monsters, Iris and with the help of my mother, who is also an avid knitter (she owned a yarn and needle craft shop for over 25 years), I began working on my project. I started out with some inexpensive acrylic yarn that I had from my grandma. Well after getting that far on my practice piece I decided to just keep going. Unfortunately I didn't have enough of the gold yarn so had to switch to another color and improvise a bit with the design. Here is the fruits of my labors. It isn't perfect, I messed up a few times, but I did learn a lot. Of course I couldn't stop after just one so I bought 6 more patterns and downloaded 3 others. Here is the second of the monsters I completed. This one turned out as the pattern was written and I even learned a new technique, the "magic loop" which allows you to knit very small diameter tubes on circular needles. This is Albert the Absent-Minded Monster. And here he is with his buddy, Ira the Sweater Monster (I had to change his name, since he was originally a she, but my finished version just didn't look like a girl). I still have the wool yarn that came with the original kit for Iris and I am going to start that next since I think I have my basic skills down now. I will have to let you know how Ira's girlfriend turns out.